Former Sen. Daniel Patrick Moynihan, a New York City shoe shine boy who became an iconoclastic scholar-politician and served four terms in the Senate, died Wednesday. He was 76. The New York Democrat and former U.N. ambassador had been in ill health. He was hospitalized in January for an intestinal disorder, and again soon after for a back injury. His latest setback was an infection after an emergency appendectomy on March 11 at the Washington Hospital Center. Moynihan served in the Senate from 1977 to 2001. He was succeeded by Hillary Rodham Clinton, who announced her Senate candidacy in a torch-passing news conference at Moynihan's farm in July 1999. She announced his death Wednesday on the Senate floor. "We have lost a great American, an extraordinary senator, an intellectual and a man of passion and understanding for what really makes the country work," she said. After retiring from politics, Moynihan became a senior scholar at the Woodrow Wilson Center. Fellow legislators named Manhattan's new federal courthouse in his honor. The lanky, pink-faced lawmaker, who preferred bow ties and professorial tweeds to the Senate uniform of lawyer-like pinstripes, reveled in speaking his mind and defying conventional labels. Known for his ability to spot emerging issues and trends, Moynihan was a leader in welfare reform and transportation initiatives, and an authority on Social Security and foreign policy. After leaving public office, Moynihan stayed active in politics, from campaigning for Clinton to his recent work as co-chairman of President Bush's Social Security commission. He also championed a plan to revitalize Manhattan's Pennsylvania Station. 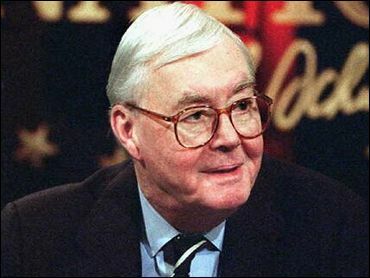 Moynihan established his academic credentials early, teaching economics and urban studies at Harvard. He returned to the classroom in spring 2001 as professor at Syracuse University's Maxwell School. During his first hour-long class there, he wondered aloud if something had gone wrong with Washington. "We have lessened our capacity for large national initiatives," he said. "Something's lacking. Can it be that our energies have run out?" In his own college days, the 6-foot-5 Moynihan spent one summer tending bar, and later earned a reputation as gregarious and drink-loving. In debates on the Senate floor he was known for a love of often obscure academic references. Moynihan left Syracuse University in 1961 to work for John F. Kennedy, the first of four presidents he served. He worked in the Labor Department in the Kennedy administration, and almost immediately found himself at odds with J. Edgar Hoover's FBI over an article he'd written about the mafia. An internal agency memo called Moynihan "an egghead that talks in circles." At the bottom of the memo, Hoover scrawled, "I am not going to see this skunk." Over the next 15 years, Moynihan served as a high-ranking official in the administrations of both Democrats and Republicans — carving out a Washington career that sometimes was controversial. As President Nixon's urban affairs adviser, he proposed a policy of "benign neglect" toward minorities that drew heavy criticism. A 1965 report to President Johnson created a major policy flap when he warned that the rising rate of out-of-wedlock births threatened the stability of black families. Moynihan saw himself at the time as a liberal observer warning of future problems. Rather than hearing praise, he was denounced as promoting racism. The controversy haunted Moynihan for years and resurfaced as late as the 1994 elections. As U.S. ambassador to the United Nations, he beat the drum of anti-communism and demanded that other countries temper their anti-U.S. rhetoric if they wanted American help. His unyielding support of Israel made him popular with New York's Jewish population and his televised statements at the United Nations elevated Moynihan to near-celebrity status. Hoping to win a Senate seat in 1976, Moynihan emerged the winner of a bitter five-way Democratic primary. In the general election he defeated incumbent Republican James Buckley by portraying him as out of touch with New York City's fiscal crisis. Moynihan's own ads proclaimed: "He spoke up for America. He'd speak up for New York." Moynihan's fascination with global affairs never waned, and he continued to speak and write about world events, at one point foretelling the collapse of the Soviet Union. "The Soviet Union is a seriously troubled, even sick society," he said in a January 1980 speech on the Senate floor. "The defining event of the decade might well be the break-up of the Soviet empire." With a staccato delivery that emphasized unexpected syllables, Moynihan's speaking style was often mimicked. He wrote or edited 19 books — more it was said, than some of his Senate colleagues had read. During his years in the Senate, Moynihan became a champion of many of the liberal Democratic programs he had once questioned, defending public jobs programs and fighting to increase federal aid to help offset New York's crushing welfare burden. In 1988 Moynihan, long one of the nation's foremost authorities on work and family, helped bring together conservatives and liberals to enact the Family Support Act, a major revision of the nation's welfare laws. Born in Tulsa, Okla., Moynihan was the eldest of three children. He spent his early childhood in Indiana, before moving to New York City. The Moynihan children were raised by their mother after their father deserted the family when Pat was just 10. To help provide money for the family, Moynihan became a shoe shine boy. As a teenager, he first heard of the attack on Pearl Harbor while working on a customer's shoes outside Central Park. Moynihan graduated from high school, worked on the docks and attended City College. After a stint in the Navy, he went on to college at Tufts on the G.I. Bill. He also attended the London School of Economics with a Fulbright scholarship. Moynihan and his wife, Elizabeth Brennan Moynihan, had three grown children, Timothy, Maura and John. They spent summers in an old one-room schoolhouse in the upstate hamlet of Pindars Corners where he liked to write.